We are now down to the last 4 days before we leave. We are doing well but then we have help. I started to remove all the old bottom paint but then realised there is no way I am going to be able to do this in the time we have. So, I hired Bau and his hard-working team of two to come and do it for me. What a relief and what a job. 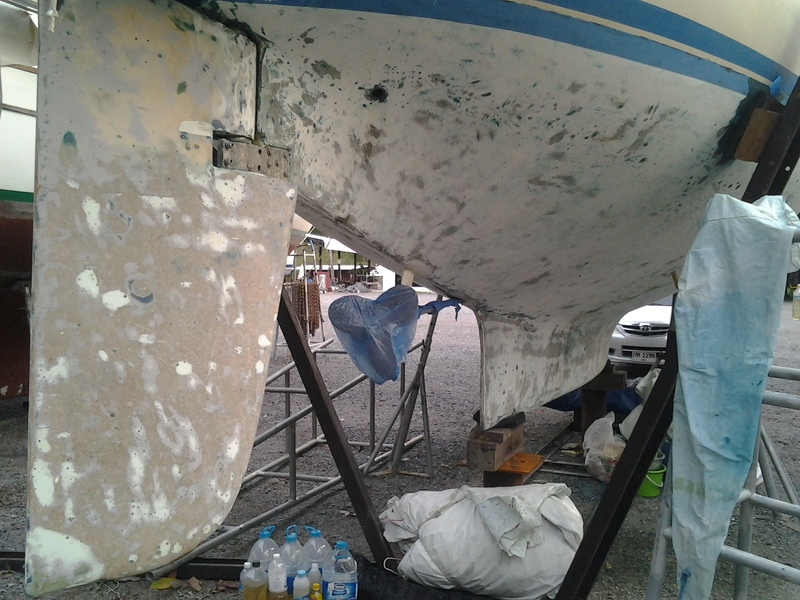 First it’s the paint remover application and then it’s laborious scraping and sanding to get down to the fiberglass. May look like the pox but it isn’t. It’s now done thanks to their hard work and I can leave the boat to dry out while we are gone. That’s always good for a fiberglass boat as contrary to a lot of people’s thinking fiberglass is not impervious to water. Fiberglass does soak up water over the years and problems like blistering does occur. Luckily for us this has not happened although I do suspect that there have been a few bubbles in the gelcoat which has been repaired. 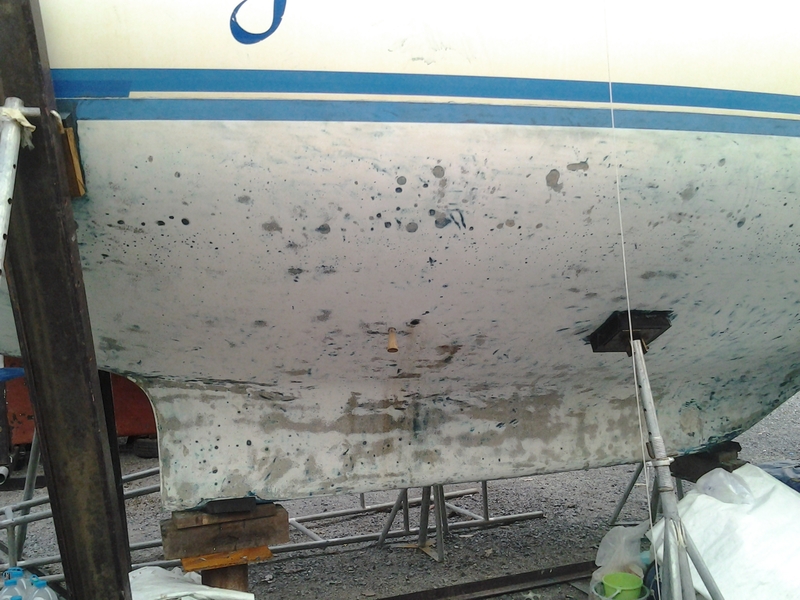 When we come back we do have a big job of filling, sanding, applying barrier coats, applying undercoat before we get into finally putting on the antifouling. Right now we can relax as a major part has been completed and we are very happy this has been done before we leave. Living on the boat while on land is not the best but we are making do. Climbing up and down ladders to get to deck level, being out of the daytime breezes and having to walk 200 metres in the middle of the night to the washrooms are not all things we enjoy but there are some nice things out here in the country. There are a few great markets around where we can shop for fresh items for dinner like giant shrimps (tonight’s dinner was 8 large shrimp for$4, a freshly made papaya salad perfectly spiced for $1 and a large cauliflower for fifty cents. We rushed home before the work gates closed at 1900hrs and sat down to a great feast. Will really miss the markets here when we leave. 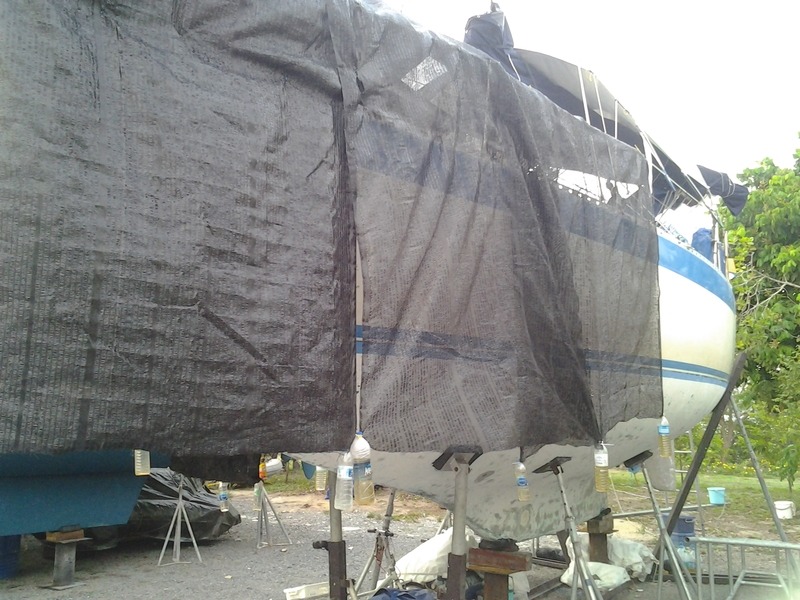 To finally put the boat into storage we usually cover the entire boat with shadecloth. 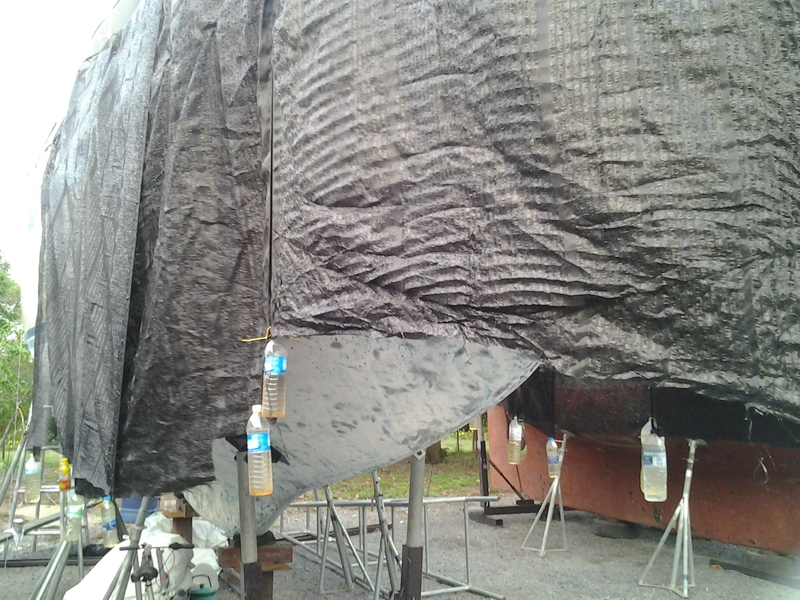 We are partway there at this point as we have finished all the jobs in the forward half of the boat. In the next couple of days we will finally don the aft section and that should protect the fiberglass and the teak decks from the punishing sun and keep the boat a little cooler.